This is the colourless diamond group. They are common enough to be found in any store, but still command the highest prices. D and E show virtually no colour. F starts to show the very slightest of colour and is the transitional colour to the next group. This is the near colourless group. If you are looking for value when you shop, ask to see stones from this group. These diamonds begin to exhibit a very light shade of colour, but it is hard to detect in mounted stones. This is the group that begins to show slight yellow colour, which may be noticeable from the top of the stone and even more from the sides. 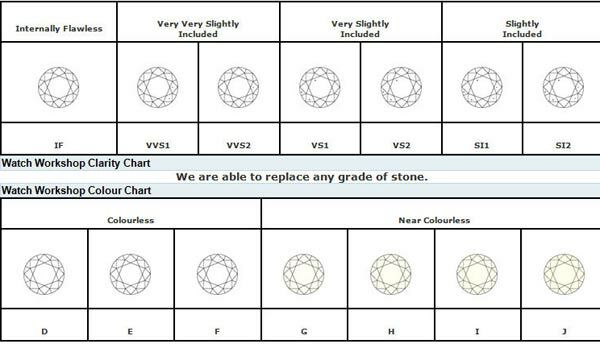 Your Watch Workshop uses G-H near colourless however colourless are available on request.